Friendships are celebrated in all sorts of ways around the world. 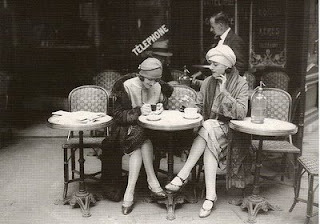 In Paris, women of all ages walk around the city streets arm and arm or hand in hand - giggling and sharing secrets, shopping together on Rue St. Germaine, or engaged in intense conversation while sipping cafe at a local bistro. Friendships are a serious part of Parisian life. This bond is understandable given how one can feel alone in a city like Paris. So, friends stick together. Sound familiar? While Madison doesn't have the Eiffel Tower hovering overhead or the bustling sounds of the Champs in the background, friendships abound here, too. In recognition of our love of the holidays and friendships, Confectionique will expand the traditional Nuit Blanche market to include a special merci mon ami (thank you, my friend) celebration on Thursday, December 8 from 5:00 to 8:00 pm. Our shop will again glisten with treasures for those on your holiday list. We are excited to feature jazz pianist Steve Banik in the lobby. As our way of saying merci to our nos amis (our friends), we will offer $10.00 off your purchase for bringing in one special Mon Ami who is new to Confectionique! It will be an evening to enjoy complimentary refreshments, listen to the sweet sounds of jazz and linger in Confectionique to your hearts content. Finally, we will be unveiling our new market cards for 2012 -- they are simply tres beau!